Are you learning English as a second language? Do you find it difficult to make the sounds of English? It can be a challenge, especially when you’re first starting out. That’s why we’re happy to announce new registration for our “Say What?” pronunciation program! 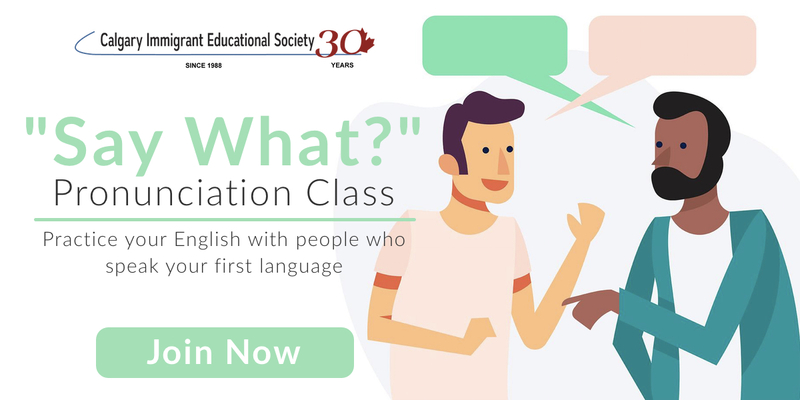 “Say What?” is a volunteer-driven class built for newcomers who want to overcome those tricky and hard to say letters, vowels, and phrases in English. When you join class, you’ll be provided with materials and training that will help you articulate English vowels and consonant sounds. Our goal? To help you enhance the accuracy of your English pronunciation and help you settle more easily into Canadian society. Classes are held between 3:00pm and 4:00pm at our Whitehorn location, and groups are made up of newcomers who share a similar root language. These include East Africa, South Asian, Middle Eastern, and Southeast Asian. See the most up-to-date schedule by checking out the schedule here. Registration is now open and you can apply by contacting us or filling out the registration on the program page.